Angela Johnson leaves the Federal Courthouse in Sioux City on May 11, 2005. "The woman deserves death," said Brenda Stone, sister of Terry DeGeus and spokesman for her family. Angela Johnson leaves the Federal Courthouse in Sioux City Tuesday after the first day of jury selection (Photo by Jerry Mennenga of the Sioux City Journal). A U.S. marshal leads Angela Johnson from the Federal Building in Sioux City Friday (Sioux City Journal photo by TIM HYNDS). SIOUX CITY — A federal judge has vacated the death sentence of an Iowa woman convicted of helping her boyfriend kill five people near Mason City. 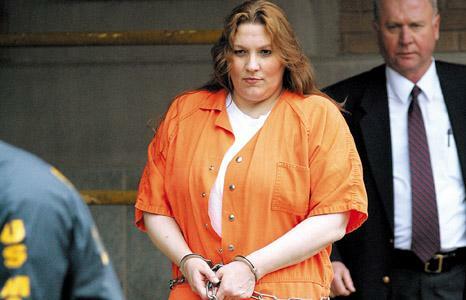 Angela Johnson, 48, of Forest City, was convicted in U.S. District Court in Sioux City in 2005 of helping Dustin Honken kill five people — including two little girls — to help cover up evidence of drug crimes. The same jury then recommended Johnson be sentenced to death for four of the slayings and receive life in prison for the fifth death. On Thursday U.S. District Judge Mark W. Bennett filed a 448-page ruling in which he found that Johnson's trial attorneys made four mistakes during the penalty phase of her trial that may have led the jury to reach a different sentencing recommendation. Bennett's ruling does not affect Johnson's guilty verdicts. She remains incarcerated in Fort Worth, Texas. The U.S. Attorney's Office has 60 days to appeal Bennett's ruling, decide not to seek the death penalty and have Bennett sentence Johnson to life in prison without parole or seek a new penalty phase of the trial before a jury. Assistant U.S. Attorney C.J. Williams, who prosecuted both Johnson and Honken, said Friday the decision on how to proceed in the case will be made by Department of Justice officials in Washington, D.C. He declined to comment on Bennett's ruling. Honken, 44, of Britt, was convicted in a separate trial and also sentenced to death and is incarcerated in Terre Haute, Ind. Johnson had filed 64 claims for postconviction relief of her death sentence. Evidence on the motion was heard in four phases of hearings in 2011 that included 19 days of testimony from 58 witnesses and thousands of pages of legal briefs. Bennett found four instances in which decisions made by Johnson's defense team were prejudicial, "that is, there is a reasonable probability that, had her trial counsel not performed deficiently, the outcome of Johnson's mitigation phase would have been different." Those four claims involved errors regarding psychological evidence of Johnson's mental health. Bennett acknowledged in his ruling that his decision would disappoint the murder victims' families and cause them pain, and that he did not take his decision lightly. "My heart does go out to them," Bennett wrote on the second-to-last page of the lengthy decision. "Nevertheless, I believe that I have done my duty, in light of what is required by the Constitution — the foundational document of our Nation's enduring freedoms, including the right not to be put to death when trial counsel's performance was so grossly constitutionally inadequate." 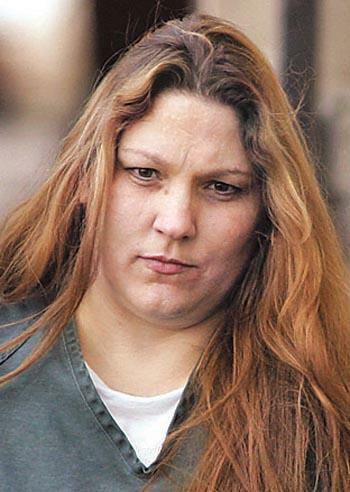 Honken, formerly of Britt, was found guilty of the 1993 deaths of five people. Greg Nicholson, 34, and Terry DeGeus, 32, planned to testify against Honken in a federal court case, exposing his sophisticated Arizona methamphetamine manufacturing operation, when they disappeared. Nicholson's girlfriend, Lori Duncan, 31, and her two girls, Kandi, 10 and Amber, 6, also disappeared. All five were found buried west of Mason City in 2000 after Honken was arrested on an unrelated drug manufacturing charge. Honken was sentenced to the death penalty. Accomplice Angela Johnson was convicted of 10 counts of aiding and abetting Honken in the murders and also sentenced to death. I'm not usually a supporter of the death penalty but I would count this as a sad day. Angela Johnson....every time I hear that name I get sick thinking about those two little girls. She's in the Federal Justice system, not Iowa's. As an opponent of the death penalty, I believe that taking away a person's life in prison one day at a time is far worse punishment as they will be forced to think about the consequences of their actions every day till death. Honken and Johnson should both be treated the same way that Zacarias Moussaoui, the so-called missing 9-11 hijacker, was when sentenced: placed in total solitary confinement with no human contact whatsoever as just punishment for the extreme nature of the crime committed. Oops! I let that one slip by... forgot about that. Still, Iowa should have the death penalty just for scum like this. I guess it also shows what a joke the entire justice system in our country has become. Scum like this get out of just punishment because of a "technicality", in my opinion. Johnson's attorneys made four mistakes...So what. I could understand if the AG or judge messed up but come on. Monday morning quarterbacking ANY trial would result in 'mistakes' by attorneys. They should have never gotten to this point! After the first trial of this cold blooded murderer and her sick sick boyfriend Dustin the Sheriff van should have pulled over and put two bullets in the back of each ones head. Just like the two did to those young children. I hope everyone realizes that this murderer is sitting in prison right now celebrating her life. To bad others can not. Not to mention that millions of tax payers dollars to keep this trash alive. KILL HER NOW!!! 'Katefan', you may think life in prison is worse than being zapped, but the ISSUE is the COST of incarceration. Btw, Judge Bennett is a liberal, appointed by Bill Clinton to federal bench. Dems just love those technicalities, and leave us taxpayers holding the bag. It's time for a capital punishment tax credit, which will allow taxpayers who support the death penalty to take $100 off of their federal tax liability, and shift the costs, INCLUDING legal services, to anti-capital punishment Libs. Why not list her lawyers' names? They screwed up. Shouldn't they face public consequences? The Kansas City Star listed names of her screw-up lawyers. In fact, they even quote Dean Stowers as saying, "I'm happy she's going to get a new shot at things because she deserves it." He screwed up on purpose so she could use it as an excuse to get out of the death penalty. If you commit a crime in Iowa and hire Dean Stowers, you'll end up with the death penalty even though there is no Iowa death penalty. Wow, reading all these posts definitely indicates the character of Iowans. Between misrepresentation and the medias "slant" you are condemning a woman without knowing the truth! What you read and what actually happened are two different things, unless you were there to witness the murders. Unfortunately this woman was loyal to the wrong man!! Instead of coming forward to exonerate her, he is letting her rot in a prison for his crimes! What a cowardly act for any man!! The lawyers should be held accountable! They didn't provide her with a defense at all! Ineffective assistance of counsel almost got this woman killed! Is that justice? Todd, Judge Bennett is anything but a liberal when it comes to criminal cases. If he overturned the sentence, then the attorneys messed up. And keep this in mind, my understanding is that the sentence was overturned, NOT the conviction. Sometimes, the sentencing hearings take longer than the actual trials do in Federal Court. And, sorry to say, whether or not capital trails and executions are cheaper than lifetime incarceration is debateable..sometimes prison is for life is cheaper! Johnson provided the map that lead the police to the bodies of the mom and the little girls. I was there when Terry DeGeus's body was found ...You're WRONG!! These two are guilty and deserve to be fried. Have you ever seen the buried remains of two baby girls? It's the cold blooded murder of the little girls that's gonna get this whore executed not her defense teams ineffectiveness. You asked-- is this justice?? I say no.. not until that whore fries..then justice is served. Former Iowegian said, Between misrepresentation and the medias "slant" you are condemning a woman without knowing the truth! What you read and what actually happened are two different things, unless you were there to witness the murders. So..you were there and witnessed the murders?? Your eyewitness testimony can prove she wasn't involved? Unless YOU were there, former iowa, how do you know 'for sure' johnson wasn't involved? what evidence do you have to exonerate her? NONE..zip it. Forgive me for my language..this upsets me. sorry. Put them both in "General Population" in prison , justice will prevail ! Neither deserve to live ! Well Redstate, I find it hard to believe you were present when any body was found. By your comments it sounds like you are pretty ignorant REDSTATE. You have as much evidence to convict her as I do to exonerate her. Knowledge and participation in a crime are too different things. Knowledge should never be a reason to put anyone to death. So unless you can put yourself at the scene of the murders on the night of the murder, you zip it! I appreciate your response, 'CL Hawk', but executions are WAY cheaper than keeping cretins alive. The voltage to zap them is next to zero. We'd save even more by using ropes, which can be re-used. 'Gideon v. Wainwright' caused this mess, along with other unconstitutional Warren Court rulings that never should've been allowed to stand. Had Andrew Jackson been the Democrat in office (instead of JFK-LBJ) when such rulings were issued, they wouldn't have been allowed to stand. Bennett is a liberal. I agree someone should pay for such a heinous crime, but let it be the person responsible, not someone associated with him! There is truth in the phrase "Guilt by Association!" You think about that the next time you are with someone that the next time you are in the company of someone doing something illegal! Your association means you are guilty too! Do you really know what your friends and relatives are doing behind your back? Knowing or not, it could cost you your life or your freedom! CL Hawk sorry but I have to agree with Todd, a bullet costs a fraction of a dollar. 74 cents to be exact. And RedState, I can only imagine how witnessing something so horrible follows you the rest of your life. As a mother, Angela Johnson should have never gotten involved with drugs in the first place, she should have been taking care of her children. I knew her from the area, and all I ever heard her talking about was her badass life and how tough she was. Sorry, no sympathy here. Shoot her. The self-righteous have always ranted about their preferred styles of excuting judgment in the most inhumane words and images that they can muster. The fact that they themselves have so far escaped judgment and consequences for their own costly offenses seems to consistently elude them. The "self-righteous" ones here are the LIBERALS, 'Ally'. Even IF Johnson's lawyers made mistakes, in HER case it doesn't justify vacating the sentence, as she used public defenders. When taxpayers provide the lawyers, and such lawyers screw up, the beneficiary has NO right to complain. This is basic, common sense, based on REALITY - AKA unknown territory to Liberals. 'Gideon v. Wainwright' was/is unconstitutional; it cost$ the USA money it hasn't got, and it keeps bad people from being zapped. Crime, including MURDER, was LOWER prior to the Warren Court's unconstitutional 'Gideon' ruling. Did some innocent people go to jail, or maybe even get executed? Probably. But that was a relatively small price to pay when compared to the EXECUTIONS of innocent, law-abiding Americans by killers whose actions were effectively facilitated by liberal court rulings. Being unable to afford a lawyer, and knowing that victims may seek/get their OWN justice, kept many a hoodlum in line, back in the day.